I am not sure which report option would be best for me, where can I learn more? How old should you be to take the DiSC or MBTI assessment? What does the DiSC instrument measure? How do I view the results for the DiSC "View Instantly" assessment? Where do personality types come from for the DiSC profile? How can a DiSC personality assessment help me understand myself and others better? Are your answers right or wrong? What will I learn from a DiSC report? How will I get my DiSC results? I would like to use the 'Cannot View Results Version' of the DiSC for my team, what is the process? I would like to order a facilitator report or group culture report for my group, what is the process? Do the assessment links expire if I do not use them right away? Do I have to be certified to administer the DiSC within my organization? How long does it take to complete a DiSC assessment? I am not sure which report option would be best for me, how can I learn more? We suggest viewing the sample reports to help you decide which report option will be best. Just go to the report descriptions and pricing and click on the last bullet point where it reads "Click here to view a sample of this report" and you will be able to open the PDF document and view the corresponding sample report. Please contact us if you are still unsure which report option would be best for you! The DiSC and MBTI assessments are intended to be used by those who are 14 years or older. They are written at the 9th grade level for easy understanding. The DiSC instrument from Wiley Publishing measures traits that are described by the DiSC model. They are expressed in the form of "styles" summarized as: Dominance (D), Influence (i), Steadiness (S) and Conscientiousness (C). The DiSC instrument has been continuously refined and updated over the last several decades and today, the Everything DiSC Series (Workplace Profile, Management Profile, Sales Profile and Work of Leaders Profile) embodies these DiSC model refinements and represents the latest and most current generation of the DiSC instrument available today. Just click on the assessment link and enter the user name and password you selected when you completed the assessment. You will be able to view your report and can print it, save it to a computer or email it. If you are a team leader who ordered the report for someone else you will be unable to view the report unless the individual who completed the assessment emails it to you. The DiSC instrument from Wiley Publishing is based on the work of William Marston first described in 1928 in his book Emotions of Normal People. Marston believed that by understanding how our "normal" emotional responses adapt to the demands of of people, situations, and societal expectation, we could evolve into better- integrated people who were more independent and able to realize true happiness in our work lives and personal lives. What Marston characterized as emotional responses or "primary emotions" are known today as Dominance (D), Influence (i), Steadiness (S) and Conscientiousness (C). When you receive your results, you will learn that there are many different ways to interact with others, to make decisions and how you approach situations. Learning more about yourself and your preferences will give you increased understanding about your friends and co-workers which can help improve your interpersonal relationships. There are no right or wrong answers for DiSC assessment. The responses you provide help to assess your own personal tendencies and preferences in a given situation. By understanding your preferences better, you gain greater understanding into how you will respond most comfortably to a certain task or situation. By knowing your personality preferences, you will gain greater understanding and clarity into your preferences, your strengths and areas you may want to develop further. By understanding yourself better you will be able to appreciate the styles of other people and personality types. You can use your greater understanding and improved self-awareness to assist you in making education and career-related decisions to have a more satisfaction in your job, your relationships and your life. You will be able to view your results immediately upon completing the assessment online. You can then save the report to your computer, print it email it. We suggest that you name the report and save it to your computer so that you will have it for quick and easy reference whenever needed. After you place your order, a receipt will be emailed to you containing individual assessment links for each profile you ordered. To issue the links, simply copy, paste and email a link to each individual in your group and ask them to click on the link and follow the instructions. After they complete the assessment, they will not be able to view their report. Instead, we will manually generate and email the report to you using the email address you used to place the order. DiSC reports are manually generated and emailed within 1-3 hours during Eastern U.S. (EDT/EST) business hours. Please contact us if you have additional questions about how we can assist you with your group! These are excellent report options to be used with a group of individual DiSC reports for a team. You only need to order one of either or both reports (Facilitator Report or Group Culture Ceport) per group. In addition, you also need to order an individual DiSC report for each team member. If you order either or both of these report options for your group, we will generate and email your Facilitator Report and/or Group Culture Report after your entire group has completed their individual DiSC assessments, or upon your request if your entire team is not finished yet. We will also ask you for a team name or group name that you would like us to display for you on the cover page of your group reports. You can also provide your team name to us during the checkout process and enter it in the �Additional Information� box. The assessment links are valid for 3 years from the date they are issued on your receipt. The links will expire after 3 years if they have not been used. 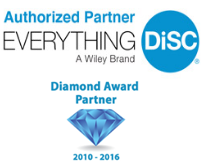 No, you do not have to be certified to administer the DiSC within your organization. The reports are designed to be very user-friendly and easy to interpret. The DiSC Classic 2.0 consists of 28 items and takes about 10-15 minutes to complete. The Everything DiSC Workplace Profile, Management Profile and Sales Profile consist of 79 items and takes about 20-25 minutes to complete. It is not timed and you can stop if you need to and then return to the assessment simply by clicking on the assessment link and clicking the word "Next" three times in the lower right hand corner. You will be able to continue where you left off or start over.